As the best salon and spa in Lake Zurich, Daybreak Salon and Spa has been serving Lake Zurich and surrounding northwest Chicago suburbs including Buffalo Grove and Barrington since 2013. Part of being the best means using the best, that’s why our team of highly-skilled professionals use Aveda hair and skin care products, Glo Skin Beauty, Kérastase hair care, HALOCOUTURE hair extensions, Cinderella Hair Extensions, OPI nail polish and more. 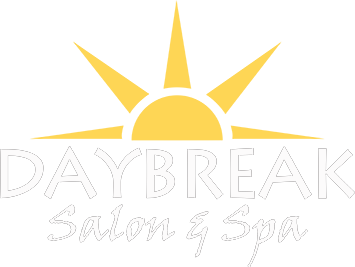 New To Daybreak Salon and Spa? 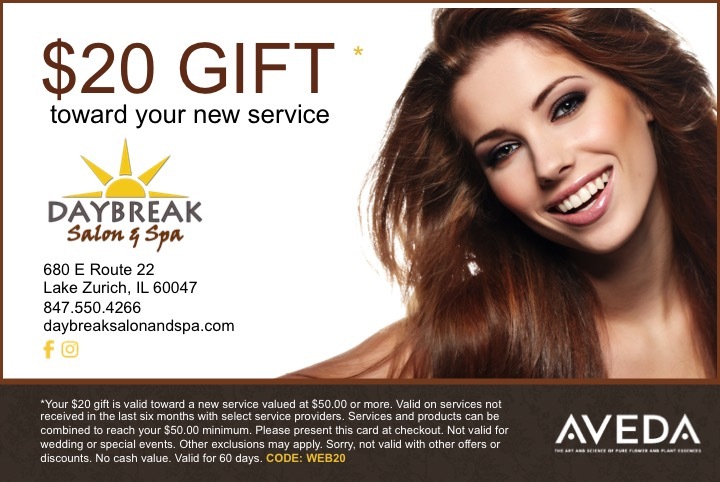 Download our $20 gift toward your new hair or skin care service using Aveda, Glo Skin Beauty, Kérastase and other premier products. See what guests are saying about their hair and skin care services featuring Aveda, Glo Skin Beauty products and more. Additional guests’ comments found on our Facebook page. We’re ready when you are. Book your appointment online at the best salon and spa serving Lake Zurich, Buffalo Grove, Wauconda, Palatine, Barrington, and Hawthorn Woods or give us a call at 847.550.4266. Service is astounding, stylists are all personable and wonderful. Love the events. The women in my family are big fans of Daybreak Salon!! Myself and all of our daughters love the professionalism and services provided. Meghan is our favorite along with Mo, Nikki and more! This May we had our daughters wedding day salon services provided by everyone at Daybreak including airbrush make-up, hair, nails and food/drink!! The day went flawlessly and we were all ready on time! Thank you Meghan and Daybreak Salon! Professional and talented people, and high quality products! I got my hair and color done, and I strongly recommend this salon. Excellent services, prices and great friendly staff. Great selection of hair products. Nice relaxing atmosphere. Great faculty and services. What else could you want. My daughter and I will always go back there. Fantastic extensions too. They lasted longer than any we've ever had.